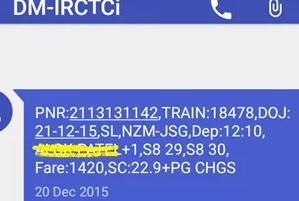 Using software like Aam Aadmi Tatkal you can regenerate IRCTC ETicket SMS and send it to any mobile number in India. It costs on some 40 paisa. However it requires valid license key which can be got only after payment of money. The barcode contains all ticket information. The data in the barcode can be verified using a barcode reader to know the details of an IRCTC eTicket.